The project site did not have any crops or plants growing. No sustainable practices were used on the site. Compost and compost teas are integral parts of organic farming. The large populations of beneficial bacteria, nematodes, fungi, and protozoa found in compost can correct deficiencies in the soil food web, create healthy and fertile soil, and act as an organic/natural pesticide. Compost is a sustainable method for erosion control, plant health, land and stream reclamation, and environmental remediation. Compost containing beneficial microbiology is not commercially available in Southwest Missouri and represents a large gap in our community’s ability to create healthy soil, regenerate our ecosystems, and engage in sustainable, organic agriculture best practices. Composting best practices require training to identify and create optimal soil microbe ratios for use in crops and permaculture systems. 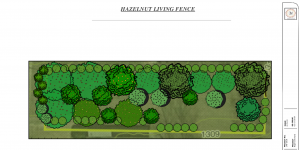 This project will provide training and education to Southwest Missouri farmers and at-risk homeless youth to develop small scale replicable compost and compost tea systems with measurable microbe health using demonstrated best practices. 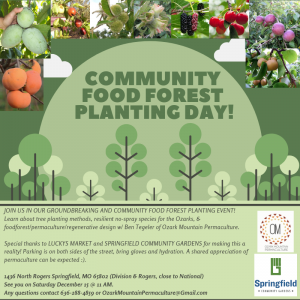 Using a highly successful train-the-trainer model developed by Springfield Community Gardens through a National Association of Conservation Districts grant, workshops will include education on soil health and creation of compost and compost tea systems. In conjunction with the project, an abandoned urban lot in an impoverished neighborhood will be remediated and revitalized. Develop an economical and replicable small farm process for compost and compost tea recipes with optimal soil health for plant disease. Create positive environmental impacts and a strong foundation for a resilient inter-generational food system by increasing soil life and and resiliency. Empower and educate the community with practical tools to positively transform the environment and local food production using soil science and regenerative agriculture. Build on previous collaborative efforts of individuals and organizations in the community who are skilled at implementing and teaching sustainable agriculture and conservation methods. 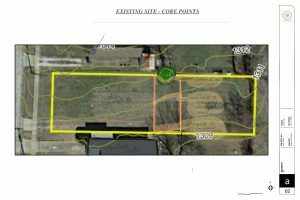 The initial step was to obtain biological soil samples at the abandoned urban lot in Southwest Missouri chosen as the project site. 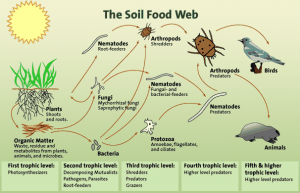 Understanding the current status of the soil and the microorganisms missing from the current soil food web required a soil analysis. 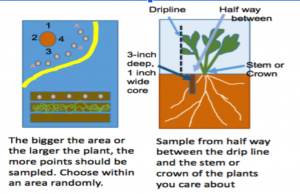 This soil analysis would provide details on what optimal soil microbe ratios are required in the perennial system. 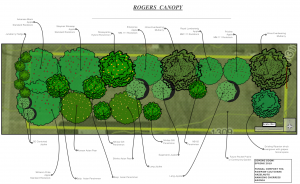 After the missing biological components are identified, compost that will add those microorganisms back into the soil ecosystem to benefit the perennial shrubs and trees will be added to the site. The process of obtaining a soil sample was initiated shortly after the reception of the grant. In order to collect a biological soil sample representative of the overall soil at the project site, a through analysis of the land was completed, including identifying current crops or vegetation and assessment of the soil. A base map of the site was produced and a site assessment was conducted based on Elaine Ingham’s research on soil microbes and soil analysis. The 25’ x 50’ testing area encompassed three different elevation points and was located in the middle of the lot near a mature tree (which in theory would have a fungal dominated microbiology). Soil core samples of 3 inches deep and 1 inch wide using a professional soil corer (Figure 1) were taken in three central locations on the property and followed Ingham’s methods (Figure 2). The contours on site were also mapped to ensure each sample was approximately at the same elevation but randomly selected on that elevation. 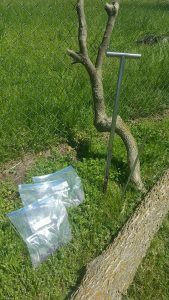 Soil Sample A was at the highest point and included a combined five soil samples taken between the drip line and the trunk of the tree (Figure 3). Plants near this core sample included a mature Hackberry and white clover. Due to our understanding of the history of the land, it is believed that herbicides had been used on the northern fence line in an attempt to control “winter creeper” by the City of Springfield (who owned the lot previously). Soil Sample B was taken in the middle of the site and was dominated by crabgrass, white clover, and dandelions. We took core samples at the roots of these plants, half-way between the drip line and the stem (see figure 3). Soil Sample C was lowest in the landscape. Mostly crabgrass was growing in this area. After the samples were collected they were placed in sealable sandwich bags, labeled with indelible ink on the outside of the bags (date, plants around, notes) and shipped via FEDEX overnight to the Environment Celebration Institute Inc. soil lab. The following trees were planted at the project site on December 15, 2018. 1) Pear varieties: Korean Giant Pear, Shinko Asian Pear; 2) Apple varieties: Williams Pride Apple, Staymen Winsap Apple, Arkansas Black Standard, Pristine, Enterprise, Royal Lumbertwig; 3) Illinois Everbearing Mulberry; 4) Juneberry; 5) Persimmon varieties: Saijo Persimmon, Nikitskaya Bordovaya Persimmon, Zima khurma =NB-02 Persimmon, Rossenyanka Persimmon; 6) Jujube varieties: Sugar Cane Jujube, Lang Jujube, So Contoured Jujube. Soil Sample A was at the highest elevation and had a number of plants growing nearby and is thought to have previously experienced regular weed control application. The soil analysis from this location had a very high amount of bacteria and ciliates (anaerobic protozoa) which indicate highly compacted and anaerobic soils. Soil Sample B was taken in the middle of the site and was dominated by crabgrass, white clover, and dandelions. This sample had a very high amount of bacteria and ciliates (anaerobic protozoa), which indicate highly compacted and anaerobic soils. Soil Sample C was lowest in the landscape. The tests revealed a high amount of bacteria but no ciliates were documented. 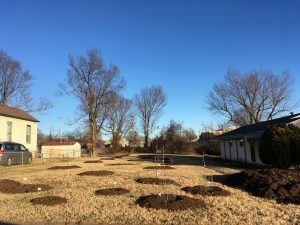 The soil analysis provided by the lab identified the need for perennial trees and shrubs, a diverse array of fungi, protozoa (flagellates amoeba both zero), nematodes, and predatory nematodes. The results identified the three soil core samples to be highly bacteria dominant and contained an elevated concentration of anaerobic ciliates protozoa (excluding sample C) with an acutely limited diversity in organisms. In essence, the soil test showed that the land at this location requires biological and fungal nutrients for tree production. Once the soil analysis is complete, a compost formula to provide the vital organisms to feed the soil food web will be identified. How much compost or compost tea for the site depends on the organisms in the compost. It is confirm that soil additives are biologically active and will supply the organisms needed to correct the soil food web. According to research by Elaine Ingham, 1 to 10 tons per acre of solid compost per application, depending on the organisms in the soil and in the compost, is required for successful incorporation of compost and fungal food into the soil. For compost tea or extract, 1 to 5 to 20 gallons per acre per application (depending on organisms) is required in the Spring and Fall seasons. Since the project site is .22 acres, we plan to use 5 gallons for the compost tea and extract. This project is currently developing a highly fungi dominated thermal compost pile and will add fungal foods to the compost tea. The thermal compost consists of 10% Nitrogen (food scraps, chicken waste), 60% fungal foods (leaves, diverse array of different hardwood and softwood species mulch, cardboard, and papers), and 30% bacterial foods (greens). A protozoa infusion may be needed to control bacteria ciliates in the soil, once the compost is added. The recipe for the compost tea is currently being identified and finalized. Additives will include a Mycorrhizae inoculant, humic acids, glomus aggregatum, glomus etunicatum, glomus intradices, and glomus mossae (all Fungal foods). The current goal for the project is to monitor the compost and compost tea preparation developed based on the soil analysis described above to ensure the beneficial soil organisms increase at controlled levels. The project leaders will correct, balance, and maintain those levels, as necessary. Additionally, the project leaders will continue to monitor compaction, puddling, watering requirements, growth rate, color, disease, and pests within the crops planted on the lot. A new microscope was purchased to assist with performing additional soil tests, collecting more data, with the primary goal of creating optimal fungal compost. 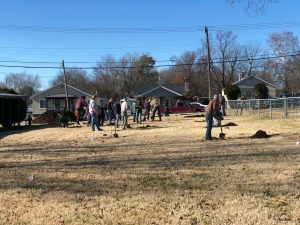 This project was widely advertised amongst Springfield Community Garden’s (SCG’s) large network of volunteers, donors and supporting community members, in addition to support provided by Tiffany Frey, Executive Director at the James River Basin Partnership. 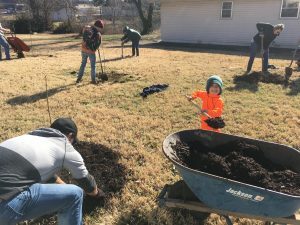 The social media campaign included information about the grant, available workshops and information gained as part of the Soil and Composting Classes. Two workshops and several one-on-one consultations took place during the fall and winter. The workshops were advertised on social media posts on SCG’s Facebook and Instagram pages as well as on the grant participants’ personal blogs, social media and business pages. In addition, the workshop and grant project was publicized by SCG’s staff at its board meetings and other events. 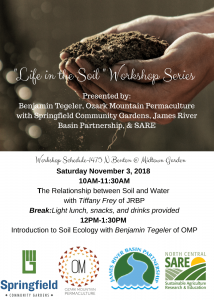 The initial workshop – “The Relationship Between Soil & Water” by Tiffany Frey – focused on the role water plays in agriculture and how unhealthy soil contributes to the loss of fresh groundwater that is essential for productive crops. Tiffany highlighted the importance of using restorative agriculture techniques, such as swales, hugelkultures, natural windbreaks, no-till/low-till practices and rain water harvesting to improve soil health. Ben Tegeler expanded on the foundation of soil health introduced in Tiffany’s presentation by going in-depth into soil ecology, the soil food web and vital microorganisms. Ben’s lecture outlined the difference between soil and dirt and provided a brief overview of the importance of the five levels of the soil food web, including the importance of maintaining appropriate levels of bacteria and fungi in soil. In addition to the two workshops, a hands-on learning project in collaboration with Lucky’s Market was provided during December 2018. 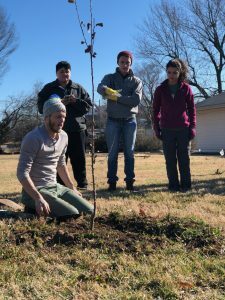 The Community Food Forest Planting Day was a great success with over 27 community-members joining Ben Tegeler and team, SCG and Lucky’s Market representatives for a tree planting and discussion of food forest design. Through the soil sample analysis and the Life in the Soils training, project leaders learned how to better explain to other farmers the need for a substantial perspective shift from a linear view of soil amendments as a general fix to a more comprehensive knowledge of the universe of microorganisms in the soil and the soil food web that sustains the land and crops produced. A partnership between farmer and the extensive living community of microorganisms in soil is required in order to rebuild the increasingly disused, nutrient deficient, and disease-burdened land in the area. The realization that small changes can have significant affects on the soil and crop production has been one of the most substantial current learning outcomes both for the project leaders and those attending the workshops. “The value of the SARE composting project has been life changing. Because of the information that was given to me from the workshops I have gained knowledge that will help fulfill my non-profit, who’s mission is to divert food-waste from the waste stream and provide composting education for the community. I have learned how the soil food web functions properly and how compost can help to heal the over worked soils. This information is life changing because it provides an answer for degenerative soils and the ever-haunting climate change dilemma. If we can put life (microorganism, fungi, protozoa, nematodes, anthropoids, etc.) back in the soils and allow for the soil to hold carbon again, we have a chance at reversing climate change. This provides a solution for every community member to be involved in. I have gained the knowledge for these solutions with the SARE compost grant. I am the founder and executive director of Springfield Compost Collective and the experience I have gained through this grant will help to complete the mission of my non profit because it has connected me to community members, other non profits, and soil/compost experts that I can now call on when needed to form partnerships. This composting project has shown me how to correctly and most efficiently make life giving compost and compost tea that is full of beneficial bacteria and fungi. I am confident in my skills and knowledge to hold high level composting and soil health workshops for my community as well as travel to speak at conferences sharing the knowledge I have gained. I plan to make the most beneficial compost I can for the community based on the knowledge and experienced gained from this information. I am currently working on applying the compost knowledge to Springfield Community Gardens’ 18 garden locations along with scheduled thermal composting workshops in the Spring. I have successfully create 3 thermal composting piles and am currently working on a thermal composting project to create compost tea for unusable soil lots in hopes that next season life will be back in the soil food web and thriving.